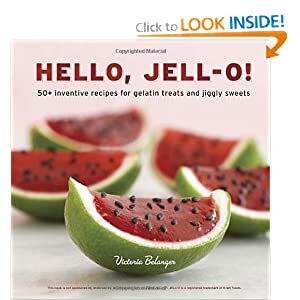 Order Hello Jello Cookbook - In Hello, Jell-O!, Belanger shares her secrets for turning humble gelatin into impressive yet economical desserts that will steal the show at your next party or potluck. Featuring holiday crowd-pleasers such as Pumpkin Pie and Eggnog Rum, kid-friendly favorites like Root Beer Float Squares, grownup boozy bites like Sparkling Champagne and Strawberries, and vegan delights like Watermelon Basil Agar, the Jello Mold Mistress serves up recipes for every occasion. Mix flour, brown sugar, butter and nuts in a bowl, press evenly into a 9"x13" pan and bake at 400 degrees F for 12-15 minutes. Be sure not to burn the crust. Allow to cool before adding next layer. Dissolve lemon jello in 1 cup of hot water (this is less water than normal). In a seperate bowl, combine cream cheese (room temperature), powdered sugar, vanilla and blend with mixer. Add Cool Whip and continue mixing. Once lemon jello has cooled completely, slowly add to cream cheese mixture using mixer. Pour mixture over crust and refrigerate for 2 hours. Dissove 2 boxes of strawberry jello into 3 cups of hot water. Stir well to ensure that all of the gelatin is dissolved. One the jello is completely cool, and the first layer has been refrigerated for 2 hours, pour cooled jello onto cream cheese layer and allow to set. Wonderful dessert! My husband's favorite. I used 1/2 cup mac nuts and it turned out great.